I decided to use up beaucoup fabric making Simplicity 4188 view A. There was a time when I would buy 6 yards (5.5 m) of fabric when I wasn’t sure what I would make with it. But that didn’t really work. I filled up my storage space quickly, so I stopped doing that. 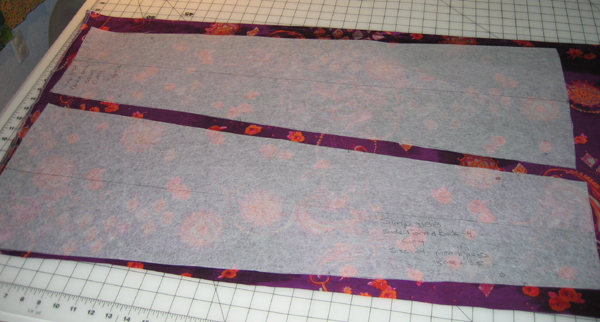 This pattern calls for 5.5 yards (5 m) of 44 inch fabric. I have 2 cuts of cotton fabric that long, but one is a border print. Whew! That was close. I’m not supposed (self-imposed, yet often broken, rule) to buy any more fabric. The pattern layout directions are stupid! I was able to cut out the skirt from less than 4.5 yards (4.125 yards). I would have been pissed if I had gone out and bought 5.5 yards of expensive fabric for this. The construction has gone very well. I’m almost done. Sewing a gored skirt is always a pain; this is a gored skirt with godets, so it was something like sewing a 16 gore skirt. I find inserting godets difficult. If I do it the traditional way (sew to the insertion point then add the godet), I always get an ugly, crumply godet tip. I searched the PR message board for godet discussions and found this review. She sews the the godet to a panel then attaches the next panel, so there is no crumpling at the tip. I found the sewing problematic. So I decided to try sewing the 2 panels together, only I stopped an inch (2 cm) above the insertion point. I inserted the godet by attaching it to one side, then carefully pinning at the top of the godet so that everything was smooth and flat at the top of the godet. I sewed the second side of the godet, and then I sewed the little hole that was left at the top of the godet.